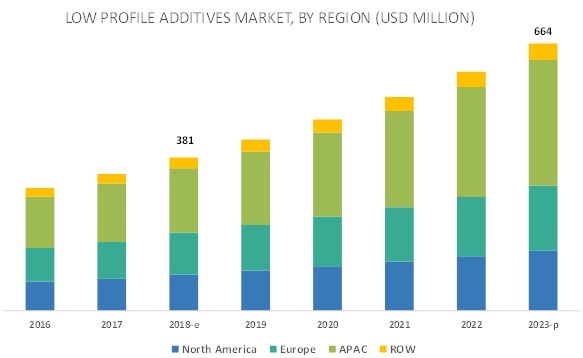 [100 Pages Report] The low profile additives market size is estimated to be USD 381 million in 2018 and is projected to reach USD 664 million by 2023, at a CAGR of 11.8%. 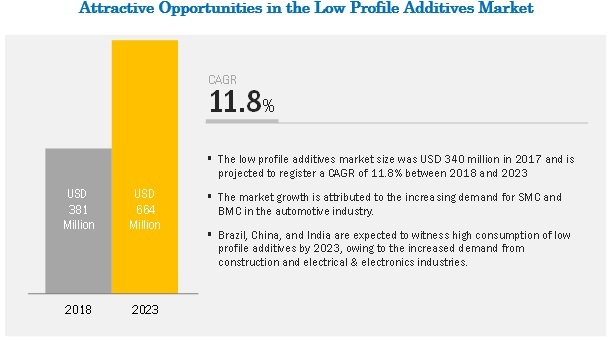 Technological advancements in the automotive industry and increasing demand from electrical equipment and appliances are the key factors driving the low profile additives market, globally. In addition, the growing demand for renewable energy, especially wind energy, will augment the growth of the market, globally. By type, the PVA segment is expected to be the largest contributor, in terms of value, in the low profile additives market during the forecast period. The PVA segment is estimated to account for the largest share of the low profile additives market during the forecast period. The high market share is attributed to its extraordinary solubility characteristics during the curing phase of unsaturated polyesters, excellent shrinkage prevention in end products, and easy availability. By application, SMC/BMC is expected to be the fastest-growing segment, in terms of value, in the low profile additives market during the forecast period. SMC/BMC is projected to be the fastest-growing application of low profile additives during the forecast period. The growth of this segment can be attributed to the growing demand for lightweight materials in the automotive industry. In addition, increasing commercialized use of electric vehicles is boosting the demand for these compounds, which, in turn, is driving the low profile additives market. For instance, Nissan (Model Name: Leaf), GM (Model Name: Bolt), Kia Soul, BMW, and Tesla Motors have successfully commercialized electric vehicles in the passenger car market. APAC is the major revenue generating region in the global low profile additives market owing to its large industrial base and growing urbanization. APAC is also the fastest-growing low profile additives market, globally. The growth of the APAC low profile additives market can be attributed to the augmentation and modernization along with new technological developments in the automotive industry. In addition, several initiatives undertaken by the governments of different countries of the region to attract investments from various international companies are also expected to propel the growth of the APAC low profile additives market during the forecast period. Wacker Chemie (Germany), LyondellBasell Industries (Netherlands), Polynt-Reichhold Group (Italy), AOC Aliancys (Italy), and Interplastic Corporation (US) are the key players operating in the low profile additives market. These companies have adopted various organic and inorganic growth strategies between 2015 and 2018 to strengthen their position in the market. Agreement was among the key growth strategies adopted by these leading players to enhance their regional presence and meet the growing demand for low profile additives from emerging economies. In November 2018, Polynt-Reichhold Group (Italy) and Gazechim Composites (Sweden) entered into a distribution agreement with Gazechim Composites (Sweden) to distribute unsaturated polyester products, gelcoats, and bonding pastes. The development will increase the market share of Polynt-Reichhold in Europe and also help to cater to the increasing demand for low profile additives, globally. In August 2018, LyondellBasell (Netherlands) acquired A. Schulman, Inc. (US), a global supplier of composites, high-performance plastic compounds, and powders. The acquisition doubled the existing company’s compounding business and broadened its reach in various growing end-use industries such as automotive, construction materials, electronic goods, and packaging. In August 2018, AOC and Aliancys (Switzerland) signed a merger agreement to create a global resins group. AOC Aliancys will now supply polyester and vinyl ester resins, gelcoats, and other materials for the composites industry. The merger will bring innovative composite solutions to various industries, globally. In November 2017, Wacker Chemie (Germany) opened a technical center for the construction, textile, and consumer care applications in Istanbul. The center enabled the testing of tile adhesive and external thermal insulation composite systems that are the two key applications of Vinnapas. What are the upcoming hot bets for the low profile additives market? How are the market dynamics for different types of low profile additives? What are the significant trends in applications influencing the market? Who are the major manufacturers of low profile additives? What are the factors governing the low profile additives market in each region? The study involved four major activities in estimating the current market size for low profile additives. The exhaustive secondary research was done to collect information on the market, peer market, and parent market. The next step was to validate these findings, assumptions, and sizing with industry experts across value chain through primary research. Both top-down and bottom-up approaches were employed to estimate the complete market size. Thereafter, the market breakdown and data triangulation methodologies were used to estimate the market size of segments and subsegments. In the secondary research process, various secondary sources such as Hoovers and Bloomberg BusinessWeek were referred to identify and collect information for this study. These secondary sources included annual reports, press releases & investor presentations of companies, white papers, certified publications, articles by recognized authors, gold standard & silver standard websites, food safety organizations, regulatory bodies, and databases. The industry’s supply chain and market size, in terms of value and volume, were determined through primary and secondary research. After arriving at the overall market size using the estimation processes as explained above the market was split into several segments and subsegments. In order to complete the overall market engineering process and arrive at the exact statistics of each market segment and subsegment, the data triangulation and market breakdown procedures were employed, wherever applicable. The data was triangulated by studying various factors and trends from both demand and supply sides in the electrical & electronics and automotive industries. Notes: Micromarkets1 are defined as subsegments of the low profile additives market included in the report. Core competencies2 of the companies are determined in terms of their key developments, SWOT analysis, and strategies adopted to sustain their position in the market. Total 15 major players covered. This research report categorizes the low profile additives market based on type, application, and region. Country-level analysis of the low profile additives market is provided on the basis of application.